Indeed, we’re not looking at a true numbered list from 1-100 which makes deciphering stats a bit of a task. It’s also worth reiterating that the grouping is based on revenue, not copies sold. Games like Grand Theft Auto V, DOTA 2, Fallout 4 and Rocket League made it into the Platinum tier (first – 12th best seller) while other seemingly popular titles such as Doom fell to the Gold tier reserved for 13th-24th best sellers. Also of interest is the fact that several older games managed to make it into the top 100. For example, Bronze tier (41st-100th top seller) games Terraria, Left 4 Dead 2 and The Sims 3 are at least five years old at this point, as are Silver tier (25th-40th top seller) titles The Elder Scrolls V: Skyrim and Sid Meier’s Civilization V, a true testament to their replayability. The list arrives on the final day of the annual Steam Winter Sale which runs through 12pm CST on January 2, 2017. 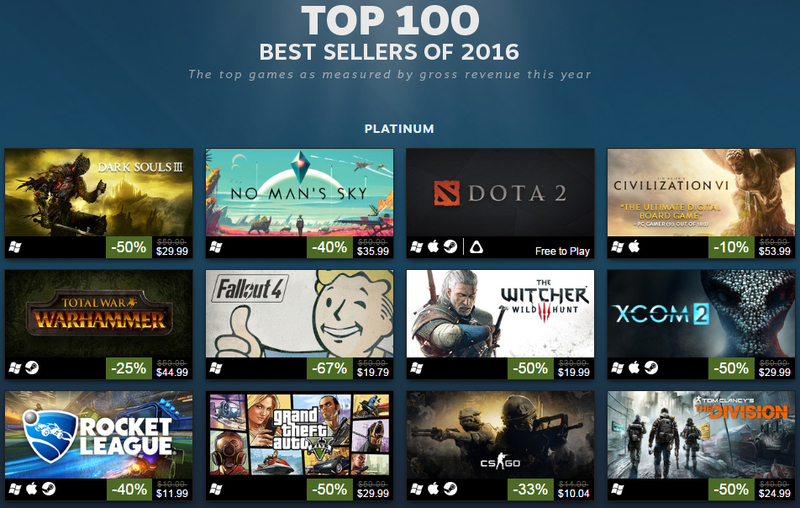 Conveniently enough, all but just a handful of the top 100 are also on sale as part of the Steam Winter Sale.